June 1972: he made his first appearance on stage at the Minamiza theater, performing in the drama "Ten'ichibô". July 1975: he received the name of Ichikawa Ukon at the Kabukiza, performing in the dance "Ninin Sanbasô". July 1980: revival at the Kabukiza of the never-performed 5th act of "Yoshitsune Senbon Zakura"; Ukon played the role of Suruga Jirô Kiyoshige [more details]. April 1987: Ukon took part in the revival at the Meijiza of the play "Jûni Hitoe Komachi Zakura", which included the famous Tokiwazu-based dance-drama "Tsumoru Koi Yuki no seki no To" [more details]. 1 August 1993: first edition of the special performance produced by the association Ukon no Kai; Ukon played the role of Danshichi Kurobê in the play "Natsu Matsuri Naniwa Kagami". 21 August 1993: second edition of the special performance produced by the association Ukon no Kai; Ukon played the roles of Taira no Tomomori and Ozawa Gyôbu Tomofusa in the plays "Yoshitsune Senbon Zakura" and "Mochizuki". August 1994: third edition of the special performance produced by the association Ukon no Kai; Ukon played the role of Kawachiya Yohê in the play "Onna Goroshi Abura no Jigoku". He also played the main role of the dance "Hanami Yakko". January 1995: Ukon took part in the 14th Kabuki performances at the Asakusa Kôkaidô to celebrate the 100th anniversary of the Shôchiku Company [more details]. August 1995: fourth edition of the special performance produced by the association Ukon no Kai; Ukon played the role of Kamiya Jihê in the play "Shinjû Ten no Amijima". He also played seven roles in the spectacular dance "Ôtsue Dôjôji". August 1997: fifth edition of the special performance produced by the association Ukon no Kai; Ukon played the role of Igami no Gonta in the "Sushiya" scene of the classic "Yoshitsune Senbon Zakura". He also played the main role of the dance "Kokaji". July 1998: Ukon became nadai and celebrated it by playing the role of Kokingo in the classic "Yoshitsune Senbon Zakura", which was performed at the Kabukiza. August 1998: sixth edition of the special performance produced by the association Ukon no Kai; Ukon played the role of Hayano Kanpei in the fifth and sixth acts of the classic "Kanadehon Chûshingura". He also played the roles of Shizuka Gozen and the ghost of Taira no Tomomori the dance "Funa Benkei". August 1999: seventh edition of the special performance produced by the association Ukon no Kai; Ukon played the role of the warrior Kumagai Naozane in the drama "Kumagai Jin'ya". He also played the main role of the dance "Ukiyo Buro". August 2000: eighth edition of the special performance produced by the association Ukon no Kai; Ukon played the role of Shunkan in the drama "Heike Nyogo no Shima". He also played the main role of the dance "Tsuri Gitsune". December 2000: premiere at the Kabukiza of "Kaka Saiyûki", Ichikawa Ennosuke III's version of Kawatake Shinshichi III's 1878 drama "Tsûzoku Saiyûki" (Kaka was the haimyô of Ichikawa Ennosuke III); Ukon played the role of Songokû [casting]. July 2002: Ukon played the bombastic role of the warrior-monk Benkei in the play "Gohiiki Kanjinchô". October 2003: revival at the National Theatre with the Omodakaya guild of Nagawa Kamesuke I's drama "Hade Kurabe Ise Monogatari"; Ukon played the role of Kujaku Saburô (later Ban no Yoshio) [casting]. January 2017: Ichikawa Ukon I takes the name of Ichikawa Udanji III  at the Shinbashi Enbujô. 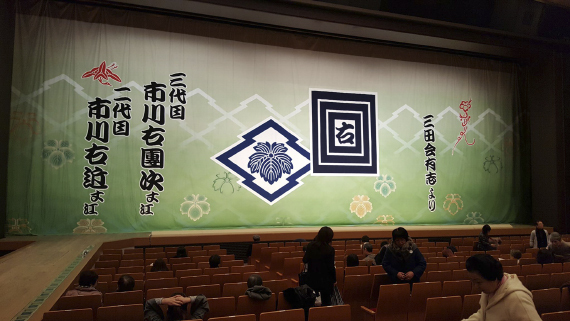 His son makes his debut on stage (hatsubutai) and receives the name of Ichikawa Ukon II. the new Udanji plays the roles of Sarushima Sôta (later Awaji Shichirô) and the yakko Gunsuke in "Futago Sumidagawa", the role of the pilgrim Shichibê (in reality the Heike warrior Akushichibyôe Kagekiyo) in "Shikorobiki" and the role of the priest Ajari Yûkei in "Kurozuka" [more details]. Ichikawa Udanji III is a dynamic tachiyaku of the Takashimaya guild. From July 1975 to December 2016. The name of Ichikawa Udanji has not been used for almost 80 years. Both Ichikawa Udanji I and Ichikawa Udanji II were Kamigata actors and they were famous for their keren performances. The third Udanji was born in Kansai and he is also accustomed to spectacular stage tricks.